Interested in keeping current with new posts or comments? If so, simply provide your email below and new posts will automatically be sent to your email inbox. If you prefer to use an RSS Reader, use the buttons below to chose the RSS Reader you want updates sent to. Anonymous on Sisman Shoes & The T. Sisman Shoe Co. Ltd.
Heather on Sisman Shoes & The T. Sisman Shoe Co. Ltd.
Blaine on Sisman Shoes & The T. Sisman Shoe Co. Ltd.
laura on Sisman Shoes & The T. Sisman Shoe Co. Ltd.
Rand Brown on Is Aurora Friendlier than other Communities? If you are interested in sharing your opinions with other citizens of Aurora, we want to hear from you. Pick your favourite topic -- sports, traffic, environment, youth, culture -- we don’t care. Plus, if you simply have something to say, have a question you always wanted to ask, or are just interested in what fellow Aurorans think, we'll post your questions or comments under the heading Community Corner. To start the conversation, send us an email. What does an Ethics Commissioner Do? The final outcome of the Phyllis Morris SLAPP Lawsuit — which Councillor Ballard, Gaertner and Gallo still seem to be trying to pretend didn’t actually happen. Here is the letter that was sent by the Town to follow up the published apology in the newspaper. For those interested in reading the Justice Brown judgment in full — it can be read here. There has been a flurry of news articles about our wee town as a result of the decision by Judge Brown on the Phyllis Morris defamation lawsuit. In case you might have missed some, they are listed below. If you see additional articles please add them as comments and we will add the new articles to this post. Don’t forget to check out the comments on the articles. They are also an interesting read. Please help me understand how litigation against three Aurora citizens was approved. Re: EXECUTIVE SUMMARY: Payment of Legal Expenses of Phyllis Morris and the defamation action of Phyllis Morris v.Johnson et al. An Open Letter to the Aurora Town Council and the Citizens of Aurora. I am writing this as an open letter to the current Aurora Town Council and to the citizens of Aurora as I believe others may have similar questions and concerns in relation to the defamation action of Phyllis Morris v. Johnson et al. I stand open to being corrected if anyone has any new information to be shared and I look to others for answers and clarification as I don’t believe that the current information in the public domain is sufficient to explain how this action was authorized by the Town of Aurora. It is only by sharing the following questions and subsequent answers (and any questions that other Aurora citizens may contribute) that we may all learn and come to understand how this action proceeded to its present state. A considerable amount of Aurora tax money is now authorized for payment of external legal fees for this case but more importantly to me three private citizens of Aurora are still involved as defendants in this action which may take years to resolve and which may jeopardize the financial futures of their families. I realize that there are those that support Ms. Morris’ argument and reasoning for her defamation suit as equally there are those that support Richard Johnson, Elizabeth Bishenden and Bill Hogg (Johnson et al) and I respect their difference in opinions. I was from the start and still remain in support of Johnson et al but it is not my intention here to argue the legal aspects of their case as this is now in the hands of our judicial system and the lawyers. It is my intention to learn and better understand how this action was authorized by the Town and to understand how it was deemed to follow the proper legislative and administrative procedures. I recognize that Mayor Dawe and some of the current councillors that ran on a platform that included stopping the Town’s involvement in the lawsuit. I commend them for following through on this promise once they were sworn into office. I also commend those councillors and mayoral candidates that also supported stopping the Town’s involvement but who were not successful in the recent election. I can appreciate that Mayor Dawe and the current Town Council has had to responsibly deal with the matters opened by the previous council and administration and were faced with the difficult decision to authorize the payment of external legal fees to December 14, 2010. I further recognize that there may still be some legal privacy issues in answering some of my questions but that does not prohibit me from asking these important questions and seeking these answers even if they may still be forthcoming in the future when this case is resolved. In the following, I will reference the letter by George Rust-D’Eye of WeirFoulds LLP entitled EXECUTIVE SUMMARY: Payment of Legal Expenses of Phyllis Morris (to be known as the “Executive Summary”). 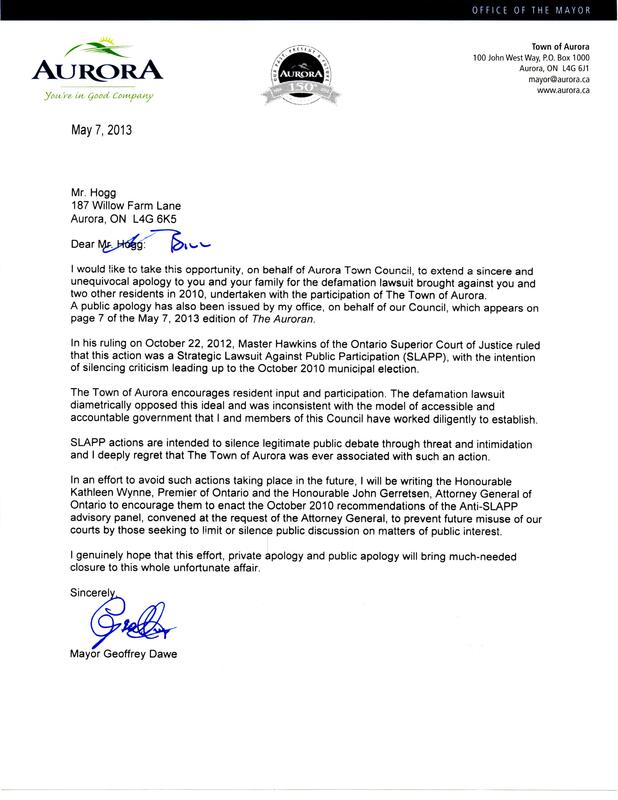 This letter was made public on March 30, 2011 as a Media Advisory by the Town of Aurora. It was authorized for release by order of the Aurora Town Council at its March 29, 2011 meeting and it can be found on the Town website at the webpage http://www.town.aurora.on.ca/aurora/index.aspx?CategoryID=27&lang=en-CA under 2011 Media Releases (March 30, 2011). It was after reading George Rust-D’Eye’s Executive Summary that I was compelled to ask the contained questions and to seek the assistance from others to help me and the citizens of Aurora better understand how Phyllis Morris v. Johnson et al was initiated by the Town of Aurora. It is the Executive Summary that makes me question past information and/or lack of information to the public in this matter. I am numbering my questions so that anyone responding to this letter can do so accordingly by the question number. 1. Who has the legal authority at the Town to proceed on the Town’s behalf with a lawsuit? 2. What are or in fact are there any legislative steps that must be complied with by the Town Council in order to initiate a lawsuit? What is the involvement and authority of the Mayor and the Town’s administrative staff, be it the Chief Administrative Officer (CAO), the Town Solicitor or any other Town staff in initiating a lawsuit? 3. I recognize that this matter started with the Council directive from the Closed Session of the Town Council Meeting of September 14, 2010. From that point onwards what were the steps and who further authorized that this matter was to be handled directly as a lawsuit? Mayor Morris left the meeting at 1:10 am. Council reconvened into Open Session at 1:11 am with Deputy Mayor McRoberts in the Chair. THAT the Council rise and report from the Closed Session to confirm the direction from Closed Session regarding the potential defamation; and THAT the Town Solicitor be directed to retain external legal counsel and to take any and all actions to bring resolution to this matter. The September 14th Council meeting initially had Mayor Morris and all eight Councillors in attendance. In the minutes it is noted that Councillor Collins-Mrakas left the meeting at 10:16 pm and Councillor Buck left the meeting at 11:01 pm. The Closed session would then have included Mayor Morris (who subsequently left at 1:10am just before reporting out and before the vote) and Councillors Gaertner, Gallo, Granger, MacEachern, McRoberts and Wilson. There is no indication in the minutes as to if any Town staff may have been involved in the closed session but since it involved litigation I would assume that the Town’s CAO and the Town Solicitor would be present, though I stand corrected if they were not present and/or if others were present. 4. Given the answers to the above questions 1, 2 & 3 and the statement “Then-Mayor requested the Town to pay for the litigation”, were the steps taken by the Town in accordance to the accepted procedures and in such a way that Mayor Morris could not be seen as having a conflict of interest as she had direct involvement in the case being that she would be the plaintiff, that the Town would be financing this action and that she would be the sole beneficiary of any awarded damages? 5. As I see no further reference to this action in any other subsequent Council Meeting in the above statement “who” is the Town? Was this a Town staff member with authority to authorize payment for the litigation? 6. Again, who at the Town had the authority to proceed with litigation? If it was the Mayor was it not a conflict of interest for the Mayor to request the Town to proceed? If it was the Mayor, should not another person (be it elected or Town staff) have taken the lead to this action? 7. Was there a reason why this matter was not taken back to Council be it in a closed session to authorize such litigation and the accompanying expenditures? 8. Thus the Town and Ms. Morris were equally and separately responsible for the full amount. The Town has now authorized payment of legal fees to December 14, 2010. Should the Town not be demanding that Ms. Morris reimburse the Town now for at least ½ of the Town external legal fees instead of as recommended in the Executive Summary “that the Town give notice to Phyllis Morris of the intent by the Town to look to her for indemnity in respect of legal services paid for by the Town out of any damages or cost recovered by her in the proceedings”? The only way that the Town will be reimbursed will be if Ms. Morris is successful and the 3 Aurora citizens are not and this does not guarantee any funds to the Town as there is no signed agreement for this option. 9. Would the Mayor have proceeded or initiated such action given that she would have to pay ½ the current legal expense? (This is now a hypothetical question and does not require an answer). 11. If it was an “agreed-upon strategy” then why if I recall correctly were some councillors apparently surprised when the news of the litigation came forth? 12. Were these instructions sufficient to proceed with the defamation suit? (Thus my earlier questions on legislative procedure). 13. Did the Town Solicitor or whoever instructed the external legal counsel of Aird & Berlis have the authority to proceed with litigation without further approval from Town Council? 14. Was the motion from the September 14th meeting so broadly worded that it could be ambiguous enough so that legal proceedings could commence without further authorization or approval from Council? 15. Did council discuss litigation as part of their closed session meeting? Was it understood that litigation was the only option that external legal counsel should pursue? (I realize that this may never be known as it was a closed session). If so, then they knew it could proceed to the current situation along with the financial burden to the Town. If not, then did someone at the Town over-step their authority (thus my earlier questions as to procedure in authorizing litigation)? Please help me understand how we arrived at the current state of affairs. It is my opinion that the council directive was far too vague and could be viewed as irresponsible as it did not provide specific direction and limitations and any need for the external legal counsel once engaged to seek further direction and authorization from council. Given the particular care that councillors take in wording their motions and given the fact that this was done at the end of term with councillors having a minimum of 4 years of experience (excluding Councillor Gallo) in their seats as opposed to being inexperienced councillors at the beginning of term it is surprising that this motion as worded was ever approved. It makes me wonder whether there is any part of this incident and/or subsequent actions that could be deemed in any way to violate the Municipal Act and/or the Town’s business and legislative procedures and if so who are we to hold accountable for their actions. I note that Councillor Bob McRoberts disavowed his approval of the September 14th motion at the September 29, 2010 Council meeting and stated on October 14, 2010 on Rogers TV First Local News, “The arguments presented by town staff and council members didn’t match my understanding of the Municipal Act. I do not agree with the rationale provided. I do not agree that the matter is a matter for Council”. I have to ask – what would have happened to the Town of Aurora if this past Council were to have directed other external contractors “to take any and all actions” for litigation against land developers in Aurora or for the repair to all roads or to improving Aurora’s water and sewage systems or to providing recreation facilities? I believe that there is still much to be disclosed to the citizens of Aurora so that we can all understand how Phyllis Morris v. Johnson et al was authorized by the Town of Aurora. I should think that the answers would be simple and straight forward. The campaign financing deadline for disclosing political contributions is March 25. Citizens will be able to evaluate what they think is appropriate and what is not? They will also be able to see what type of financial support each candidate received and in many cases where that financial support came from. Always an interesting review. Early in the campaign there was discussion about donations from developers and the potential role or influence they might play. At that time it was noted that both Morris and Kean had previously accepted donations, but were not planning to this term. Clowater saw no issue with accepting them and Dawe indicated he did not plan to to accept them. In fact, Dawe went one step further, and indicated that if someone on his team did inadvertently accept a donation, he would return it and donate a matching amount personally to the Aurora Food Pantry. You can his original pledge and the comments here. The list of reports filed thus far are available on the Town website and can be seen by clicking here. Just a gentle reminder that we have a new Council — which means that defeated outgoing Council members are no longer in public service. They are now private citizens. And let’s not dwell on the past actions of the defeated; let’s leave them behind, together with the defeated — where the voters of this community decided they belonged. Let’s focus on future and leave the past where it belongs — with yesterday newspaper. “Humfryes, Ballard, Gaertner, and Gallo should be a good check on Dawe, to make sure he doesn’t sell out the town to developers, and gut the new official plan. I was originally going to simply respond with a comment, but then I decided to submit a stand-alone post and see if we can’t have some fun with it. First, to reiterate, I stated during the campaign, that I would not accept donations from developers. I said this a number of times and I was quoted (accurately) in the paper. So, that fact is very much public, and I fully expect it will be verified with my audited returns. As I used to have to say to my kids, what part of NO do you not understand. personally donate an equal amount to the Aurora Food Pantry. HOWEVER, should the audit show that I indeed DID NOT receive donations from developers then I ask Anonymous to make a donation to the Aurora Food pantry – say $100.00. What say you, Anonymous? Are you up for this challenge? Are you ready to make a positive difference to life in Aurora? For those waiting with bated breath, the results are in and Paul Pirri was “announced” as the eighth Councillor elect. The previous 7 were unchanged as well. There were also no disputed votes. We understand there is a 15 day period where candidates have the opportunity to challenge any disputed votes. However since there were none, the waiting period is a moot point — but the Clerk cannot “declare” the winner until that time has elapsed. In any case it would require a judicial review and would be outside the power of Council to affect this matter any further. The only other potential wrinkle would be for someone to challenge the entire electoral vote — but again this would require a judicial review. So it would appear the election results are effectively final. Congratulations to Paul and all elected Councillors. The recount was approved last night — as only Morris and MacEachern could manage a meeting. To start — the meeting took 1 hour and 45 minutes to discuss and vote for a foregone conclusion. All the members played their appointed roles. First Granger was required to declare a conflict of interest because if he were to win, he would financially benefit. Of course, Phyllis felt obligated to ask Mr Cooper if this was appropriate — to which he replied that each member of Council was required to make this determination and he was not in a position to advise. After the years of experience that Mayor Morris has — one would expect that she would know this by now. Then Councillor MacEachern — ever interested in her image as the defender of openness and transparency — asked why the special meeting did not have a section for Open Forum so residents could provide input. She insisted that the procedural bylaw be waived so the public would have their opportunity for input. Once the bylaw was waived to allow the public to speak — guess what? Rebecca Beaton (friend of Cllr MacEachern) just happened to have prepared notes to comment from (which apparently she offered to share with the press after the meeting). Walter Mastranerio (yet another friend of Cllr MacEachern) was also prepared with a question. Both questions were in relation to the accuracy of the tabulation machines. Then the Mayor and Councillors Gaertner, MacEachern and Wilson proceeded to grill Mr Leach with their concerns about the accuracy of the tabulation machines. Anyone else see where this is going? why ask questions of staff in advance when you have the opportunity to grill them in front of your colleagues to show just how smart you are. Of course, remember, staff are governed by professional conduct that does not allow them to respond as you or I might want to respond. Cllr Buck finally having seen enough of Mr Leach browbeat and answer the same questions repeated in different ways, stated the questions “appeared to her” to be orchestrated. Which immediately led to a Point of Order from Cllr MacEachern with a demand for an apology. When Councillor Buck refused on the grounds that she was entitled to make an observation of what it “appeared” to her, Mayor Morris demanded she leave the table. Cllr Buck graciously declined. This lead to Mayor Morris calling a recess and demanding that the entire audience clear the chambers. The result of this demand from Mayor Morris was actual laughter from the audience — who all seemed to know she had absolutely no authority to order such a thing. It was another comical highlight in the tragedy unfolding before us. Once the meeting got back underway, with Cllr Buck in her chair — and no apology — the Council finally made a motion. Cllr Collins-Mrakas pointed out that the motion was illegal since Council was trying to direct the manner in which the recount was conducted which is contrary to the Municipal Act. Upon question by Mayor Morris — Mr Cooper confirmed that Cllr Collins-Mrakas was correct and the motion had to be replaced. Then Cllr MacEachern tried her best to get a motion on the floor that allowed the candidate to review each and every ballot “before” it was placed in the voting machine — effectively turning the machine recount into a hand count — since only an approved ballot would be counted by the machines. Again the issue of Council directing the manner of the recount was questioned. Plus, the Municipal Act states that a new manner of recounting from the original count requires a judicial review and that is why Council is forbidden from meddling. But that didn’t stop them from trying. In the end, MacEachern finally backed off — since it was clear that Mr Leach and Cooper were prepared to stick to their guns on this issue — and if the vote was not conducted in accordance with the rules as specified by the Municipal Act, then there would have been basis for a judicial review by any candidate. Of note, through the entire meeting Cllr Gallo did not utter 1 word other than to vote in the recorded vote. Hopefully this was reflection of his aversion to the behaviour of his colleagues. We have high expectations for Mr Gallo this term since his place at the table is due to election — not selection. Finally, 1 hour and 45 minutes later, we have Council direction for a recount — which must be completed within 15 days according to the Municipal Act. This means it should be completed before the inauguration.